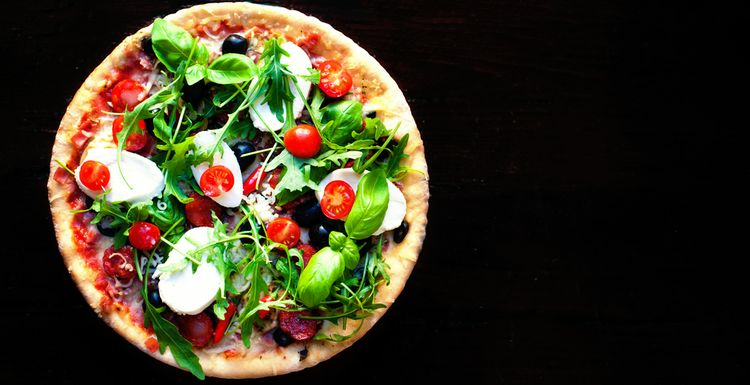 Really – a pizza that’s good for you? That’s right. We’ve got a recipe for a healthier pizza that is packed with nutrition and still tastes amazing. By replacing refined ingredients with nutrient-dense options like wholemeal flour and passata, this pizza is a viable regular option in your meal plans. This recipe makes 4 medium pizzas, so if you don’t manage to eat them all (unlikely, we know!) you can keep some in the fridge to pack into your lunchbox the next day. Or anything else you may fancy! Mix the salt and wholemeal flour together in a bowl. Combine the warm water, olive oil and yeast in a jug and leave for a few minutes. Pour the contents of the jug into the bowl and mix together to form a smooth dough. Knead for 5-10 minutes until springy. Place back into the bowl, cover with cling film and leave somewhere warm until it’s doubled in size (around an hour). Note: you can freeze the dough at this stage – useful if you want to make double-quantities! Make the tomato sauce: heat the oil and gently cook the garlic for a few minutes. Add the passata, salt and pepper. Mix well, simmer gently for 15 minutes, then leave to cool. Cook the pizza: Preheat the oven to 200c/gas 6. Cut the dough into 4 equal pieces and roll each piece out as thinly as possible on a floured surface. Line a large tray with baking paper and place the pizza bases on. Spread a little tomato sauce evenly over the bases. Add the toppings (except the avocado) and cook for 10-15 minutes until crisp and lightly browned. Add the avocado, toss on some torn basil leaves, and serve. I love pizza, but always thought making from scratch was way too much effort. This looks pretty straightforward so I will be giving it a try. Sounds delish, and I am intrigued by the addition of sunflower seeds on a pizza. Will definitely be trying that.